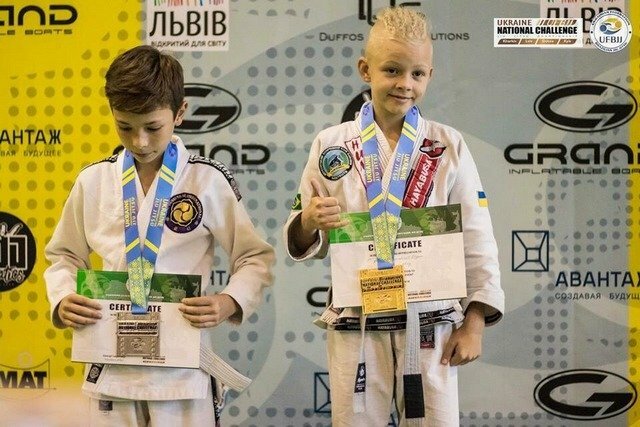 The 12-year old native of the Kherson city and the fighter of the SC “Katran” Bohdan Anykanov has become the champion of the two largest Ukrainian BJJ tournaments. Anykanov managed to win the third stage of the “National Challenge 2018” tournament this September. Bohdan participated in the weight category up to 34 kg. During the highway to success, the young fighter defeated his opponent from the “Aminov Club» by the armbar submission without giving a chance for the victory to his opponent. During the “Lviv Open Gi 2018” tournament Anykanov won his second gold. Bohdan successfully encountered three fights. The young sportsman won the 1st fight on points over the “Aminov Club” opponent. The second match was also the winning performance for Anykanov where he swept the victory over the “Garda” opponent from the Lutsk city. The young athlete won by submission over his opponent from the “Aminov Club” during the final fight. Bohdan Anykanov is diligently preparing for the upcoming “National Challenge 2018” championship final, which will be held on 15 December in Kiev.